When you’re hunting huge beasties with giant claws and even bigger teeth, you’re going to need some serious protection to shield your squishy human body from dismemberment. To help out, here’s our round up of all the Monster Hunter World armor we’ve seen so far, along with every armor skill that we’ve encountered. If you’re looking to take the fight to the monsters, we’ve got all the help you could possibly need – a good companion to this page is our guide to Monster Hunter World’s weapons, and we’ve also got a general Monster Hunter World Guide for you to peruse, too. Here’s the complete list of every armor set that you’ll find via the Low Rank quests in Monster Hunter World. In the late game you’ll unlock High Rank quests, and they come with them new armor. Each armor set is different, featuring its own unique stats, strengths, weaknesses and even armor skills (we’ll touch on those further down this page), all of which serve to help change how your character plays fairly significantly. Armor generally comes in five pieces – head, chest, waist, arms and legs – but not all armor sets contain all five pieces, so keep that in mind. Armor pieces can be mixed and matched across sets, of course. Before we get into the list of Low Rank armor types in Monster Hunter World, let’s first briefly touch on how you actually get new armor. In order to unlock a piece of armor to forge it, you’ll first need to slay the monster associated with it and carve some materials off its corpse so you have the first materials that’ll contribute towards you being able to create that new piece of armor. If you want the Pukei Armor, for instance, you’ll want to go out and hunt a Pukei Pukei, kill it, and take some materials from its corpse. 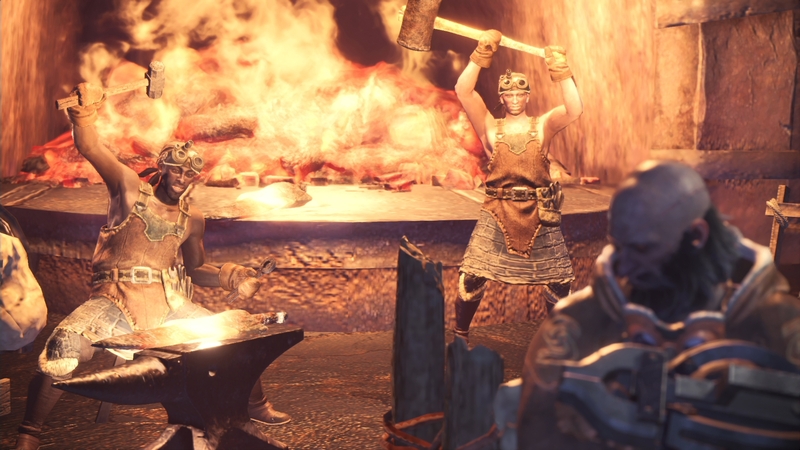 The next time you visit the blacksmith in Astera, your hub, that new armor will be available to craft. Different armor will require different levels of material investment to craft, and higher-end armor will of course require more. That’ll mean you’ll need to drag yourself out into the world and to more hunts in order to grind out the necessary materials – but that’s part of the charm of Monster Hunting. Every armor also looks different, so fashion should also be a consideration. In terms of Upgrading Armor, it’s done in much the same way – just head to the Blacksmith in Astera between missions. Upgrading Armor costs you Armor Spheres, a limited resource that drops when you complete missions but is really quite scarce. You’ll want to be careful – save your armor spheres and only spend them on armor you’ve definitely decided that you want to use. Here’s a list of all the Low Rank armors for Hunters in Monster Hunter World – and for a better idea of what these sets actually look like, there’s a video from Arekkz featuring many of them embedded above as well. This list covers the High Rank armor, unlocked later on in the game and a must for when you get into those really challenging late-game hunts. Where they’re listed as Alpha/Beta, that means there’s both an Alpha and a Beta version available, both unique. Armor skills in Monster Hunter World are powerful abilities that are part of your armor pieces, granting buffs to your character. There are tons in the game, and below is a complete list of all the ones we’ve seen so far. It won’t exhaustive of everything in the final version, but this’ll give you a good idea of the bonuses you can find. The post Monster Hunter World armor: armor sets list and all armor skills guide appeared first on VG247.